Basil Oil is Stella Cadente's newest addition for 2007. The basil oil is produced by crushing California Mission Olives together with whole basil: an artisan-produced oil. 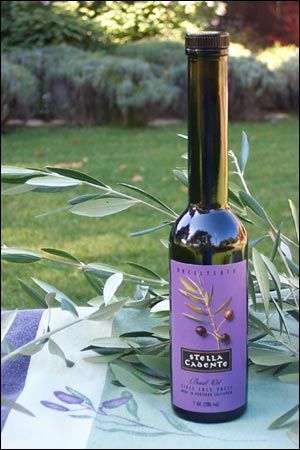 Stella Cadente basil oil is perfect for making homemade pestos, drizzling on Greek salads, in tomato soup, or with Tuscan beans. Enjoy this basil oil for dipping with fresh-baked crusty bread. Please note that this is a "crushed" basil oil and is not "infused". Most of the herbed oils on the market are "infused" and the taste profile is completely different and far less attractive to the taste buds. Stella Cadente follows tradition to insure that this award winning basil oil is made in a style consistent with old fashioned methods.